When I was a young college student at Biola University, a popular book was Decision Making and the Will of God. What I got out of this book was the idea that God didn’t care about the minute details of our lives. You shouldn’t ask God what color shirt you should wear today or whether you should go to lunch early or late. The book taught that God gives us moral guidelines in the Bible, and within those guidelines we can do what we want. That God would be happy with either wonderful choice of a marriage partner, for example. John Eldredge takes a different view. He believes that we can share our daily lives with God, ask His counsel for large and small decisions, and accept His guidance. Honestly, in the past few years as I’ve gone through the fire of being abandoned by my husband, God has been near to me like never before, and I’m finding He is indeed willing to come alongside and help and guide, as John Eldredge describes. It was inspiring to read this account of someone who is trying to live his life, walking with God. “It is our deepest need, as human beings, to learn to live intimately with God. It is what we were made for. . . .
“Really now, if you knew you had the opportunity to develop a conversational intimacy with the wisest, kindest, most generous and seasoned person in the world, wouldn’t it make sense to spend your time with that person, as opposed to, say, slogging your way through on your own? “Now, I know, I know — the prevailing belief is that God speaks to his people only through the Bible. And let me make this clear: he does speak to us first and foremost through the Bible. That is the basis for our relationship. The Bible is the eternal and unchanging Word of God to us. It is such a gift, to have right there in black and white God’s thoughts toward us. We know right off the bat that any other supposed revelation from God that contradicts the Bible is not to be trusted. So I am not minimizing in any way the authority of the Scripture or the fact that God speaks to us through the Bible. “However, many Christians believe that God only speaks to us through the Bible. “The irony of that belief is that’s not what the Bible says. “The Bible is filled with stories of God talking to his people. Abraham, who is called the friend of God, said, ‘The Lord, the God of heaven, who brought me out of my father’s household and my native land and who spoke to me . . .’ (Genesis 24:7). God spoke to Moses ‘as a man speaks with his friend’ (Exodus 33:11). He spoke to Aaron too: ‘Now the Lord spoke to Moses and Aaron about the Israelites’ (Exodus 6:13). And David: ‘In the course of time, David inquired of the Lord. “Shall I go up to one of the towns of Judah?” he asked. The Lord said, “Go up.” David asked, “Where shall I go?” “To Hebron,” the Lord answered’ (2 Samuel 2:1). The Lord spoke to Noah. The Lord spoke to Gideon. The Lord spoke to Samuel. The list goes on and on. “I can hear the objections even now: ‘But that was different. Those were special people called to special tasks.’ And we are not special people called to special tasks? I refuse to believe that. And I doubt that you want to believe it either, in your heart of hearts. “But for the sake of argument, notice that God also speaks to ‘less important’ characters in the Bible. God spoke to Hagar, the servant girl of Sarah, as she was running away. . . . In the New Testament, God speaks to a man named Ananias who plays a small role in seven verses in Acts 9. . . . Here is another book of examples, exploring the question of what it looks like to walk with God in today’s world. There’s food for thought, and there’s inspiration and encouragement. I’m a huge fan of Patricia C. Wrede’s books, particularly the Enchanted Forest Chronicles and Sorcery and Cecilia. So when I heard she had written a new book, I snapped it up. “Everybody knows that a seventh son is lucky. Things come a little easier to him, all his life long: love and money and fine weather and the unexpected turn that brings good fortune from bad circumstances. A lot of seventh sons go for magicians, because if there’s one sort of work where luck is more useful than any other, it’s making magic. “And everybody knows that the seventh son of a seventh son is a natural-born magician. A double-seven doesn’t even need schooling to start working spells, though the magic comes on faster and safer if he gets some. When he’s grown and come into his power for true and all, he can even do the Major Spells on his own, the ones that can call up a storm or quiet one, move the earth or still it, anger the ocean or calm it to glassy smoothness. People are real nice to a double-seventh son. “Nobody seems to think much about all the other sons, or the daughters. There’s nearly always daughters, because hardly anybody has seven sons right in a row, boom, like that. Sometimes there are so many daughters that people give up trying for seven sons. After all, there’s plenty enough work in raising eleven or twelve childings, and a thirteenth child — son or daughter — is unlucky. So everybody says. “Papa and Mama didn’t pay much attention to what everybody says, I guess, because there are fourteen of us. Lan is the youngest, a double-seven, and he’s half the reason we moved away from Helvan Shores when I was five. The other half of the reason was me. “I’m Eff — the seventh daughter. Lan’s twin . 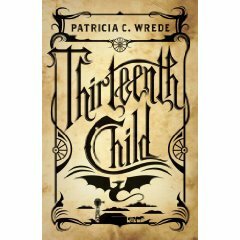 . .
Thirteenth Child is set in an alternate reality Old West, where dangerous magical creatures are kept at bay from frontier settlements by magicians at each settlement. Eff’s father is a skilled magician who goes out west to teach at a college that trains such magicians. This book reminded me of Robin McKinley’s Dragonhaven. Both are set in an alternate reality with wilderness and magical creatures. Both involve the protagonist growing up over a long passage of years. The focus in Thirteenth Child is more on building an intriguing magical world than on the plot itself. There is something of a climax at the end, where Eff plays an important part, but even she doesn’t like the attention she gets from it. She’s still an adolescent helping adult magicians, not really having come into her own yet. However, I’m encouraged that this is already described as “Book One.” Patricia C. Wrede has laid a many-layered foundation for a bigger story, which I think is going to be exciting and compelling. I only hope I don’t have to wait very long for Book Two! Recorded Books, 2007. 8 CDs. 9 hours. This is approximately the fourth time I’ve read The Queen of Attolia, and like the rest of the books in the series, I like it better every time. With its beautifully orchestrated touch of romance, this is my favorite of Megan Whalen Turner’s books, and indeed one of my favorite books of all time. Jeff Woodman does an excellent job of bringing the book to life. The advantage to listening the book instead of reading it was that I was forced not to gobble the whole thing down in one night, and got to draw out the experience. The disadvantage was that I was very unhappy to arrive at work each morning while I was listening to it. Of course, this was the perfect audiobook to be listening to just after moving. My new commute is quite a bit longer than I thought it was going to be — but because it gave me more time to spend with Eugenides, I was glad! Megan Whalen Turner creates rich and complex characters. This book more thoroughly explores the character and background of the Queen of Attolia, and we learn that her apparent ruthlessness has reasons behind it. We find ourselves actually liking someone who seems capable of atrocities. — Is that not the work of a master author? I also love the way Megan Whalen Turner explores the question of why God (only in the book it is gods she invented) allows bad things to happen. Eugenides has a Job-like moment that gives Eugenides — and the reader — a perspective on how God transcends human comprehension, but also works for our good, even when we don’t understand. Kek has come to Minnesota in winter from his home in Sudan. War has made him lose everything — his father, his brother, his home, and their family’s cows. He last saw his mother in the refugee camp before the soldiers came there, too. He is staying with his aunt and Ganwar, his older cousin who came to America before him. They too lost their family and home, and Ganwar lost a hand to the war. But then Kek sees something he does understand — a cow, old and neglected. The owner is old herself and isn’t sure she can keep her farm, but while she does, Kek can help. Kek’s story is beautiful and lyrical. We see the strange new world through his eyes, and see his inspiring ability to hold onto hope. Kek’s optimism in the face of overwhelming difficulties uplifts everyone around him, even the cow. And the reader will find his story uplifting as well. “We take a yellow bus. Danielle is eighteen years old. She’s been stealing things as long as she can remember. Her Mom is good at what she does, and she’s trained Dani how to get the job done. When they decide to work in a beach town called Heaven, things begin to go wrong. Dani meets a nice girl at the beach, who turns out to be the daughter of the owners of the richest place in town — the one her Mom plans to steal from. Then a cute guy keeps running into her and seems interested in her — and he turns out to be a cop. Having a friend or a boyfriend has always been out of the question for Dani. But now she’s getting pulled in. What will her mother say if she finds out? What will Dani’s new friends say if they find out that she’s a thief? This book pulls you into Dani’s dilemma as a young adult torn between what she’s always known, what she’s good at, and the call of a life that’s different, a life with relationships that last. This is another book I couldn’t stop reading until I’d finished it in the early hours of the morning. The story is gripping, and you do find yourself caring about Dani, but understanding her struggle. Elizabeth Scott makes the characters distinctive and interesting, but completely believable. I don’t think I’ve never met a professional silver thief, but now I feel like I know what that would be like. I’m going to have to read more of her books. G. P. Putnam’s Sons, 2009. 186 pages. Okay, I admit. When I read the first chapter of this book, it reminded me way too much of the Spy Kids movie that my children watched until it nauseated me. I wasn’t at all sure I could finish the book. 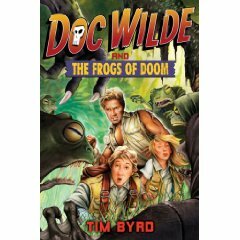 However, I found that, at least in small portions at a time, I began to be intrigued to learn in what over-the-top way Doc Wilde and his children Brian and Wren would get the better of the sinister amazonian frogs of doom. The less I took it seriously, the more fun I had reading it. For me, this did require only a few chapters at a time, but once I got in the habit, I did find myself coming back for more each night. The book is described as a tribute to the old pulp adventure novels. That is perhaps my problem — I never was a fan of those books. But I am looking forward to having this book on the library shelves. I think it will be a natural choice for young comic book fans ready for a little more text and a lot of rollicking adventure. The story is indeed over-the-top. Brian and Wren take after their father — tanned, golden-haired, strong, agile, good-looking, and incredibly smart. Throw in being magnificently wealthy with all kinds of high-tech gadgets invented by Doc Wilde himself, and you won’t be surprised when they get out of every life-threatening situation thrown at them. The fun comes in at how they get out of it this time. I like the villains — sinister mutant frogs of various shapes and sizes, some with razor-sharp teeth. There’s something simply inherently silly about Frogs of Doom. Again, I think this might be a great pick for reluctant readers, especially young boys who like adventure. It’s just silly enough and adventurous enough to provide heroic escape. Listening Library, 2003. 4 cassettes, 6 hours, 31 minutes. I enjoyed listening to a fantasy tale set in India for a change. 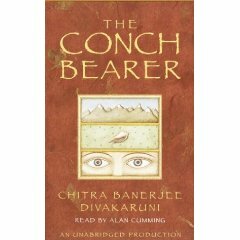 The Conch Bearer tells the story of Anand, a boy living with his mother and sister in the slums of Kolkata. Anand remembers better times and dreams of magic as in the tales he likes to read. Then Anand meets a mysterious old man with powerful magic, magic that is being sought by an evil sorcerer. The man enlists Anand’s help to return the magic conch to its rightful home in a secret valley in the Himalayas. Along the way, Anand gains a companion in Nisha, a feisty street girl. Together, they find a way to progress, despite daunting obstacles and dangers, even when their mentor can’t be with them. This was an enjoyable story. I especially liked the Indian setting and the narrator’s Indian accent. It gave the story a different slant from other fantasy tales I’ve read. I did find Anand’s emotional ups and downs annoying after awhile. He seemed to agonize about every decision, and I got to wishing he’d get on with it! This may have been exacerbated by the fact that I was listening to an audiobook. If I had been reading the book, I could have skimmed those parts. I believe the author has recently come out with the third book about the Brotherhood of the Conch. I am intrigued enough that I am going to have to read on. This is now approximately the fifth time I’ve read The Thief, and I enjoy it more every time. Listening to it on CD was a good excuse to review it again, since I’ve already reviewed the print version as an Old Favorite. I remembered why the book was a little hard to read aloud — Gen is a bit whiny and sarcastic at the beginning, and it’s a challenge to keep it up in your voice. Jeff Woodman rose to the challenge, and I thoroughly enjoyed listening to it. The Thief is a book where your perspective on everything changes toward the end of the book. So it’s tremendous fun, on rereading, to see how the author planted all kinds of information all along the way, but you didn’t see any of it, because you were looking from a different viewpoint. I really would like to see this fabulous book get checked out more often. All year, I kept suggesting it as a selection for the Homeschoolers’ Book Club. Well, May is our last meeting, so this time I didn’t suggest! I simply informed them that we’d be reading The Thief. The one who has already finished it was enthralled. I will bring the two sequels, The Queen of Attolia and The King of Attolia to the meeting so they can check them out and read on. Naturally, I am eagerly waiting to get a copy of The Queen of Attolia in audiobook form. I definitely have to read the whole series again. I don’t want to say too much about the plot, since I don’t want to give anything away. Gen has boasted that he can steal anything, and it landed him in the king’s prison. But now the king’s Magus has gotten him out of prison to take him on a mission to steal a long-lost, ancient treasure. The book is set in a world very similar to ancient Greece, and along the journey the travelers tell tales of their world’s gods. Technically, this book should probably be categorized as fantasy, but I put it under “historical,” because it gives such a feel of what it would have been like to live at that time, including political considerations. No one does any magic, though they do encounter the work of the gods. I have a hard time convincing people to read this book, because I don’t want to say too much. So I end up simply raving about how clever the author is and how good the book is and begging you to try it! I think with every rereading this book goes higher on my mental list of favorites. Truly a magnificent book. She recently did a survey of the librarians and children’s book lovers who follow her blog, asking them to list their ten favorite picture books of all time. For awhile now, she’s been posting the top 100, where she scored the books with ten points for a first place vote, nine for second place, and so on. This week, she offered a challenge. Can you guess which books will make the top ten? If any of my readers want to play, you will want to read all the books in slots 100 to 11. Instructions for submitting your choices are at: http://www.schoollibraryjournal.com/blog/1790000379/post/170043817.html. You only have about 24 hours — Sunday night, May 3, at midnight is the deadline. Today I submitted my guesses and really enjoyed doing it. However, the fun of reading these posts got me thinking. Originally, I hadn’t submitted my votes. I rather scorned the idea of choosing only ten favorites. But then the fun of the list coming out made me wish I had voted for the ones I love. At the same time, my co-worker read some of my favorite books and has asked me repeatedly for a list of favorites. With all this in mind, I have started on several lists. I like it that Betsy Bird confined the list to Picture Books, but did not include Easy Readers. Somehow, breaking it into narrower categories makes it easier to recognize wonderful books without excluding others. So I have started on lists of my favorite Board Books, Picture Books, Easy Readers, Beginning Chapter Books, Middle Grade Books, and Young Adult Books. Hmm. I will have to also do a list of favorite Fiction for Adults, but I do not think I will make a list for Nonfiction — too much variety. Now, I’m already making lists each year of my favorites in each category — the Sonderbooks Stand-outs. This would be something different. I will need to add a whole new area to my website for lists of favorites. Who knows? Once I make the general lists, I might make some new lists, such as lists of favorite YA fantasy, lists of Jane Austen related books (I already have that going within each review), lists of math-related fiction, and the like. What do you think? Please comment on my blog if you like the idea. The little catch is that I’m in the middle of a local move, my house is filled with boxes, and I’m already quite behind on writing reviews and posting them on my main site. I also want to give myself some time to make sure I remember all my favorites before I start posting the lists. So — that’s what I have in mind, and here’s hoping it won’t be too long before I bring you some lists of favorites. You are currently browsing the Sonderbooks blog archives for May, 2009.